02-06-2017 : SET Exam April 2017 Result at the end of June 2017 - Registror of Mother Theresa University Informed. 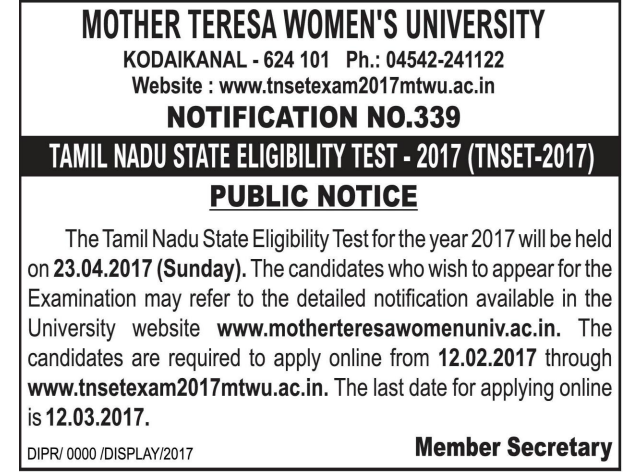 The TNSET Exam 2017 was conducted throughout Tamilnadu on 23rd April 2017 by Mother Therasa University, Kodaikanal. According to recent interview, the Registrar of Mother Theresa University has informed that the Answer Sheet Valuation works are to be completed on 7th June 2016 an the result will be published at the end of this June 2017. Top 15% candidates will be declared as Eligible. Certificate Verification for the successful candidates will be held at Chennai, Coimbatore and Madurai. 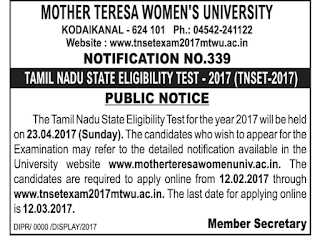 05-02-2017 : TNSET 2017 Notification is published by Mother Theresa University, Kodaikanal. 24-10-2016 : Tamilnadu SET Exam 2016 Result published on 24th October 2016. Check your result from the official website with the following details. 20-10-2016 : Tamilnadu State Eligibility Test - TNSET 2016 Result will be published with in Ten days - Dinamalar News. Asper the Dinamalar News, the Tamilnadu Higher Education Department has decided to publish the State Eligibility Test 2016 Result with in 10 days. 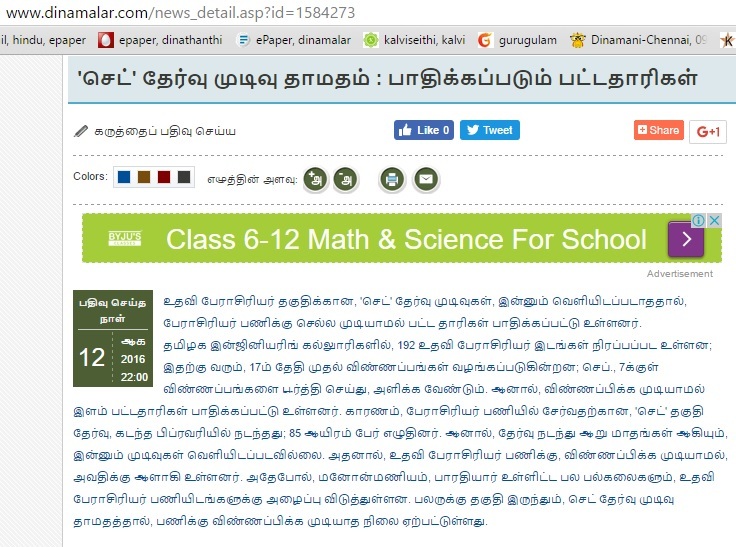 13-08-2016 : Latest News about TNSET Result in Dinamalar Newspaper today. 10-04-2016 : TNSET Result not published yet, Can candidates apply for NET Exam ? - Latest news in Dinamalar Newspaper Today. The Tamilnadu State Eligibility Test (TNSET) Exam 2016 was conducted on 21st Feburary 2016 . The official answerkeys for the examinations are not published yet by the Mother Thresa University. There is no official news from the University regarding the TNSET 2016 Result Date. Recently, the National Elegibility Test (NET) notification was published by CBSE. Candidates can apply online for the CBSE NET Exam from 12th April - 12th May 2016 at http://cbsenet.nic.in website . 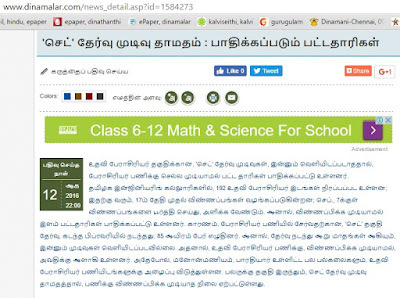 The newspaper article says that, the TNSET candidates are in trouble whether to apply for the CBSE NET Exam or wait for the TNSET Exam result. 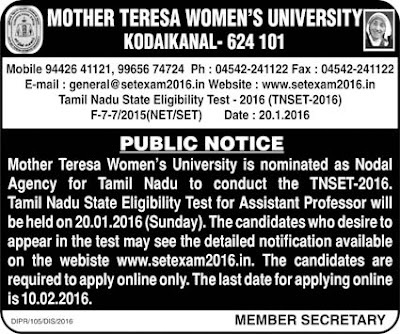 Tamilnadu State Eligibility Test (TNSET) 2016 for Assistant Professors Eligibility is notified by the Mother Teresa University, Kodaikanal. Apply online before 10th February 2016. Dear TNSET 2016 Aspirants, very short time is before you, so start your sincere preparation from today itself. All the best !